No matter if you are trying to size a metric or an inch oring you need to know two important numbers. Once you have these two numbers you can find the oring on our website. 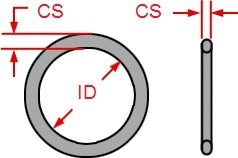 Under Categories on the left of home page scroll to "Metric B70 Orings" then click on the arrow to the right and then you will see all the cross sections listed so just click on 2mm cross section to find the 3 x 2mm orings you need. On our homepage near the top click on "Oring Size Chart" and there you will find 6 boxes. Each box will contain all the ID-inside diameters available in that CS-thickness with a Dash size or part# to the left of the dimension. Once you have the Dash size of what you need just go back to the home page and click on the left under categories for the oring material you want. All inch orings are in numerical order beginning with Dash size 001 and continuing to size 435.